Are you building a fantasy world? 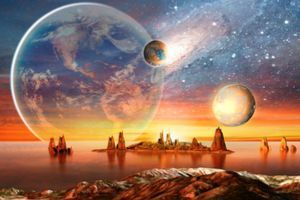 Writing a sci-fi novel? Just interested in having your own fantasy planet? Find a name for it with our planet name generator! To generate a name for your planet, we'll ask you questions like: Is there plant life on your planet? Is there sentient life on the planet? What color are the oceans? Coming up with a name for anything might need a little inspiration. Find a planet name or inspiration for a planet name by using this planet name generator!